With most of the easy gas and oil reserves discovered and prices rebounding, companies are now drilling far offshore in extreme weather condition environments. As deepwater wells are drilled to greater depths, engineers and designers are confronted with new problems such as water depth, weather conditions, ocean currents, equipment reliability, and well accessibility. Offshore Structure Design, Construction and Maintenance covers all types of offshore structures and platforms employed worldwide. 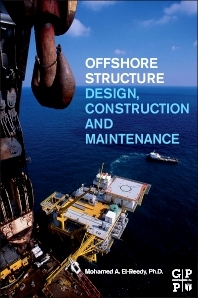 The ultimate reference for selecting, operating and maintaining offshore structures, this book provides a road map for designing structures which will stand up even in the harshest environments. The selection of the proper type of offshore structure is discussed from a technical and economic point of view. The design procedure for the fixed offshore structure will be presented and how to review the design to reach the optimum solution. Nonlinear analysis (Push over) analysis will be presented as a new technique to design and assess the existing structure. Pile design and tubular joint with the effect of fatigue loading will be presented also from a theoretical and a practical point of view. With this book in hand, engineers receive the most up-to-date methods for performing a structural life cycle analysis; implement maintenance plans for topsides and jackets, using non destructive testing. Under water inspection is discussed for hundreds of platforms in detail. Advanced repair methodology for scour, marine growth and damaged or deteriorating members are discussed. Risk based under water inspection techniques are covered from a practical pint of view. In addition, the book will be supported by an online modeling and simulation program with will allow designers to save time and money by verifying assumptions online. Structural Consultant Engineer, Gulf Petroleum Co.